Remember all the excitement surrounding the New Yorker magazine cover that was painted with an iPhone app? That was Brushes, and the whole concept of a magazine cover being created on a mobile device caused quite a stir last spring. Now, from Steve Sprang, the maker of Brushes, comes Brushes—iPad Edition, giving you the luxury of more space with which to create your own magazine cover—or any other design that strikes your fancy. Brushes—iPad Edition gives you a similar degree of artistic goodness as its iPhone companion. The app offers high-quality brushes, complete with erase mode, an eyedropper tool to sample colors, and a generous number of undos and redos so you can tweak your picture until you get it right. The new iPad app offers up to six layers (at 768-by-1024 pixels) in addition to reorder, merge, and adjust transparency features. Layer blend modes include Normal, Multiply, Screen, Overlay, and Color. 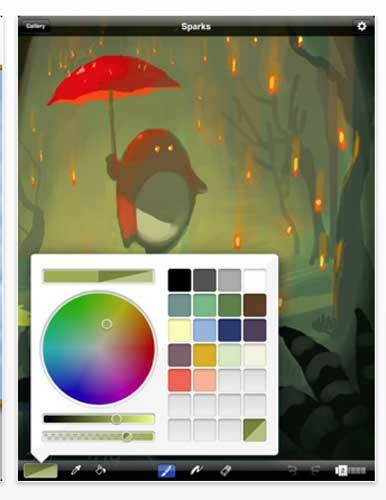 Sprang calls Brushes’ color picker “desktop class” and includes swatches. Even with the larger surface of the iPad, you still need the capacity to zoom into your image: The app lets you zoom from 50 percent to 3200 percent. Like its iPhone companion, Brushes for the iPad offers an in-app replay of your paintings wherein the app records and can play back your brush strokes. A high-resolution export of your image is possibe via the Brushes viewer desktop app. Brushes Viewer is a free application for Mac OS X that allows you to replay your Brushes paintings, export them at high resolutions, and even export them as QuickTime movies. You can also upload your paintings to Flickr. Brushes—iPad Edition costs $10 and runs on an iPad with iPhone OS 3.2 or later.